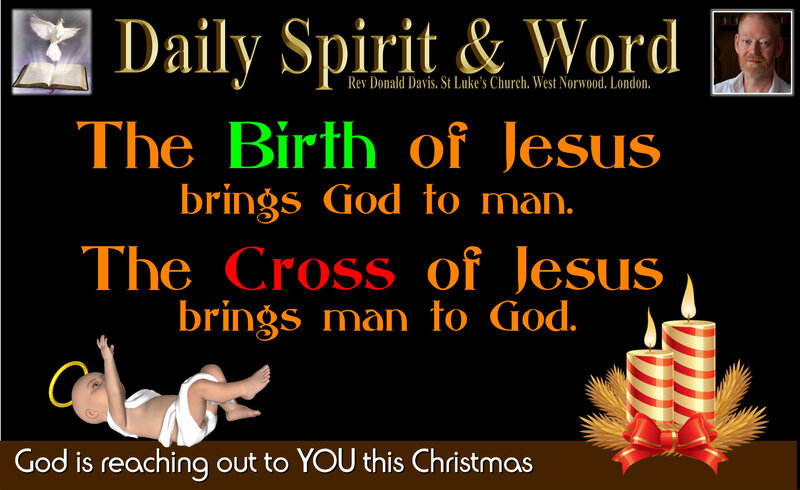 Daily Spirit & Word: 658: The Birth of Jesus Christ. “The Birth Of Christ Brings God To Man. Good morning my friends, it’s quiet, dark and cold at last, perhaps we’ll have a white Christmas? Who knows? However, it’s been a wonderful lead-up to Christmas again this year; Sunday was mega-Brilliant; With a Thanksgiving Service for two young boys, Louis and Lamar. One of whom shares a Birthday with Jesus, because Louis was born on Christmas Day. After church my wife Julie had cooked a Turkey Dinner for my sons Richard and Joe, his wife Laura and my daughter Stephanie with six of our grandchildren; only six of them 🙂 Then after dinner it was another Carol Service at the British Home for the residents. Then we had our Annual Christmas Carol Service, with Nativity Scene, Bible Readings and finally a procession of the Christingles. Lifting our lights we sang the wonders and joy of Jesus birth. You know my friends, I just LOVE Christmas: Lights, Trees, Presents, Family, Friends, Food: but most importantly, what it’s all about FAITH. My friend Glyn Cotterell from Cornwall has summed it all up very well, and I couldn’t put it better; “The birth of Christ brought God to man; the cross of Christ brings man to God.” The Lord God, through His One and ONLY Son, Jesus Christ, has done everything He can to make everything all-right again between Himself and mankind. Easter: The Saviour Rises from the DEAD. Ascension: The Saviour Returns into Heaven. Pentecost: The Power Comes: The Comforter Comes: The Holy Spirit for those who put their faith and trust in Jesus Christ. He is the one who leads us through the proclamation of the Gospel, to faith in Jesus. Then He enables us to exercise that faith and trust in Jesus for Salvation. He’s not finished yet though, because the Holy Spirit then comes again into the life, heart and soul of every follower of Jesus and gives us the New Birth. When we’re born again of God the Holy Spirit, we can then live in His POWER to bring glory back to Jesus Christ and God the Father. My friends, God has done everything to lead men, women and children to be able to have faith and to trust in Jesus Christ for Salvation, New Life and Eternal Life. Christmas really IS Awesome. It my hope and prayer that you will have a great time with family, friends, and fellow believers, but most of all with Jesus Christ this Christmas. After all is said and done; it’s HIS Birthday. What present could you give the Saviour? What’s the best present you can give Him? Not your money, though He needs you to be using that to build His Kingdom. Not your time, though He needs you to be serving Him every day. Not your talents, though He needs you to be using them for His glory. No my friends, the BEST Christmas Gift that you can give to Jesus is YOU. Why? Because that’s why Jesus came: For you. Why? Because that’s why Jesus died: For you. Let’s be sure, we’ve responded to the GOSPEL of Jesus Christ this Christmas. If you’ve wandered away from the faith, then come right back to Jesus today, because He came for you. If you’re still wondering what all the fuss is about, then take a few moments to read carefully some of the traditional Christmas Carols; you will see clearly the reasons the Saviour had to come: He came for you. I’ll go back to the great Gospel Christmas Carol: “In the Bleak Mid-Winter”. Praise be to the LORD God our Heavenly Father, Who sent His Son Jesus to bring God to men, then by allowing His Son to die upon the Cross, He made a way that is open to bring folks back to Himself. What a glorious Christmas we can have with Jesus. Happy, Glorious and Blessed Christmas and New Year to Everyone. P.S. I’d like to take this opportunity to say THANKS to everyone who’s helped in the ministry and life of St Luke’s Church. Too many wonderful brothers and sisters in the Lord to name everyone here: You KNOW who you are! Jesus has been lifted up and the Gospel proclaimed. Many have been touched by Heaven and have come to faith and trust in the Saviour throughout the year. I’m looking forward to another year of serving my King Jesus and some wonderful fellowship with you all. Be blessed, stay blessed and keep close to Jesus in the power of the Spirit. Blessings and JOY in the LORD for 2016. May you KNOW the riches of God’s mercy more and more in 2016. May you KNOW the fullness of the Spirit in 2016. May you BE filled with His compassion and LOVE. May you Experience the JOY of leading many to Jesus in 2016. May you be so full of Him that you SHINE for His glory. 2016 is Going to BE a Blessed Year: You are RICH in Christ Jesus.